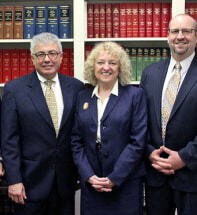 Miller, Gaudio, Bowden & Arnette, P.C., is the successor firm to Miller and Gaudio, P.C. The firm was incorporated in 1984 and its founding partners are Janice Davis Miller, Esquire, and Frank S. Gaudio, Esquire. There are four attorney members of the firm, each with his or her own specialization and unique talents. The firm offers services in the area of plaintiff's medical malpractice, products liability, complex litigation, litigation arising under labor and employment law, elder law which includes trusts and estates, workers' compensation and Social Security. The firm does not provide services in tax law but can make the proper referrals for those services. Whether you need a divorce, have been in a car accident, or were hurt on the job, our lawyers maintain clear lines of communication with you. We send detailed monthly statements and ensure you always know what is going on with your case. Our corner location is near a major thoroughfare, is handicapped accessible, and provides on-site parking. Additionally, attorney Gaudio is fluent in Italian. Contact our Red Bank, New Jersey, injury lawyers to schedule a consultation.